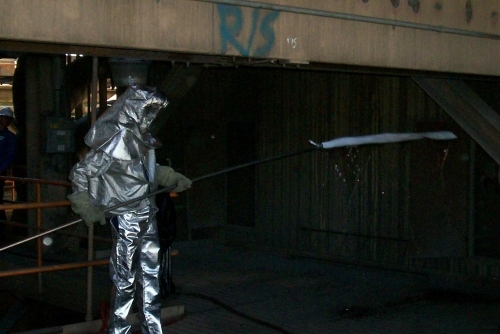 Our staff of licensed Industrial Explosive Technicans have performed thousands of cleaning jobs. Count on Evergreen North America to be your single source provider. 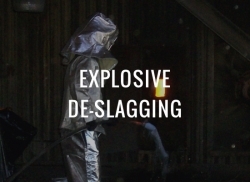 Offering the patented On-line Cleaning Service, Off-line Explosive Deslagging, Blast and Vacuum Services. Our staff of licensed Industrial Explosive Technicians - the largest in the world - has performed thousands of cleaning jobs. By offering a wide range of services, Evergreen North America can minimize your maintenance costs while reducing time spent dealing with multiple vendors. Add to that a dedication to safety, state-of-the-art equipment and professionalism, and it is plain to see why Evergreen North America is your best choice for service, performance and value. 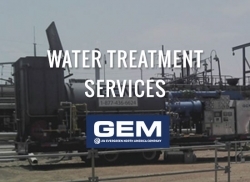 With Evergreen North America, your boiler or vessel can be cleaned while it remains in full production and at extreme temperatures. How can this be accomplished? 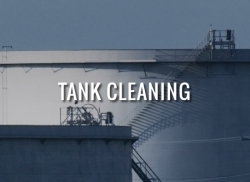 Through our patented On-Line Cleaning System, while working from outside of the unit, through access doors or viewing ports, Evergreen North America's Explosive Technicians direct our patented telescopic tooling which cools and delivers the explosive cleaning charge to the targeted boiler or vessel deposit. 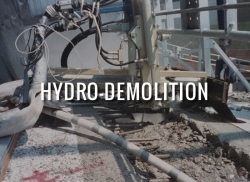 Upon controlled detonation, portions of the deposit are fractured from fouled surfaces without disturbing the unit’s integrity. This process is repeated in grid patterns and at different elevations until the cleaning objective is met. 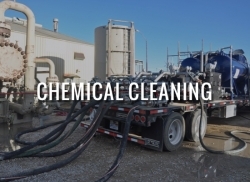 On-line Cleaning can enhance boiler efficiencies, extend run cycles and correct unfavorable fouling conditions whether moderate or severe. Evergreen North America also has the capability to now perform online video inspection of boilers, gas lanes, tanks, vessels and other confined space locations. 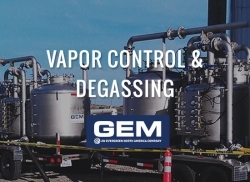 This video equipment can be utilized at temperatures exceeding 2000 degrees Fahrenheit. The use of camera assisted cleaning helps to ensure unmatched results. You can utilize this service to detect slag or deposits in hidden areas or for inspection of hidden tube leaks in boilers. This camera will provide you with a digital video for documentation and offers multi directional and zooming capabilities. 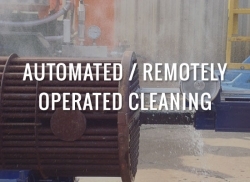 Evergreen North America offers two variations of the off-line cleaning technology. The first employs a telescopic probe which delivers the explosive cleaning charge to the target deposit while the technicians remain working from outside of the boiler or vessel. 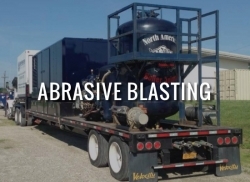 Multiple controlled detonations in grid patterns and at varying elevations quickly and safely allow for complete removal of deposits from boilers, kilns, silos, hoppers, process tanks and other large vessels. 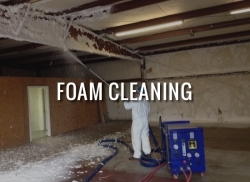 This cleaning method eliminates human exposure to falling debris, height, heat and other confined space risks. 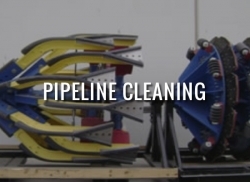 The second off-line cleaning service utilizes linear explosives and is primarily used for cleaning fouled boiler tube sections such as the superheater, reheater, convection pass and economizer. During this service, Explosive Technicians suspend linear explosive charges within the fouled boiler tube gas lanes. 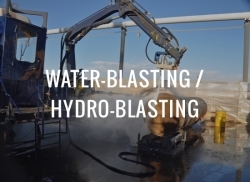 When detonated, using a delay pattern formulated specifically for each job, energy waves are released and remove hard slag and ash deposits from the tube surfaces a full 360 degrees around. 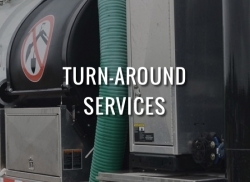 This cleaning service creates no by-product and can reduce cleaning time dramatically. Evergreen North America Flight Services' pilots and aircraft are on standby 24/365 and ready to respond to your emergency explosive cleaning needs on short notice. 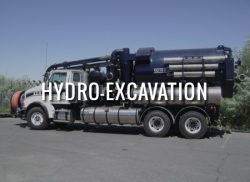 Explosive Technicians and their equipment can rapidly fly to within close proximity (regional and municipal airports) of your location, minimizing mobilization time and ensuring quicker job start. 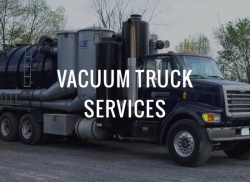 Road travel is also available for scheduled cleaning services or when deemed more cost-effective. Evergreen North America aircraft, vehicles and personnel meet all federal state and local explosive transportation regulations.